My short scifi horror story “The Peerlings” appears in the terrific British podcast series Tales to Terrify, episode 354. “The Peerlings” was first published in Beyond the Infinite – Tales from the Outer Reaches (Things in the Well series), edited by Steve Dillon. In the story, members of an off-world colony begin to vanish once elusive creatures–who can only safely be heard, not seen–descend upon their home. The mayor must figure out how to protect her citizens while warding off mass hysteria and a brewing rebellion. The story begins at 00:21:21 and is read by Amy Paonessa (Twitter), host of The Bloodlust horror review website. She does an amazing job bringing the characters to life and conveying a sense of desolation and isolation throughout the piece. Funny enough, a few people have mentioned that Netflix’s recently released Bird Box (based on the 2014 British novel) reminded them of “The Peerlings.” Check it out on Tales to Terrify and decide for yourself! Trembling with Fear Year One is a collection of horror short stories and drabbles. My short horror scifi story “Turning Tides” appears Trembling with Fear: Year 1, a print anthology collection of horror-themed flash and short fiction now available. “Turning Tides” was first published at The Horror Tree’s January 29, 2017 online edition. The story is what’s known as a “drabble.” These are flash fiction pieces taken to an extreme, incorporating style, character and plot all within a paltry 100 words. The new collection, which includes both dribbles and flash stories, is edited by Stephanie Ellis and Stuart Conover, who curate the immensely popular Horror Tree website. This Trembling With Fear anthology is a compilation of all the drabbles, flash fiction stories and dark poetry published during 2017 at HorrorTree.com. In its pages you will find work from both the novice and the established writer, the newbie and the award-winner. Here, the dead walk and murders abound, demons and ghosts torment the living whilst vampires and wolves compete for space with internet and aliens. Within these pages you will find dark speculative fiction from contributors across the globe, for our world is a world without borders. Nowhere is safe from the dark. We have had some amazing talent contribute to the first year of ‘Trembling With Fear’ and we hope that you enjoy reading these as much as we have! Read more or buy the book (digital or print) here. Horror Stories in Lovecraft eZine available! My story BETTER HALVES and other unsettling paranormal and cosmic tales are now available in the print issue of Lovecraft eZine (#36), published by Mike Davis. I wouldn’t want to run into that creature at night! I am honored to have my story reprint, “What the Storm Brings,” included in this Stoker finalist anthology with a number of excellent female horror writers. FRIGHT MARE – WOMEN WRITE HORROR is now available on Amazon in print and ebook format. Check out that eerie cover! Everyone suddenly gets the ability to fly, but it’s not all it’s cracked up to be. Is it aliens, superpowers or something more sinister? 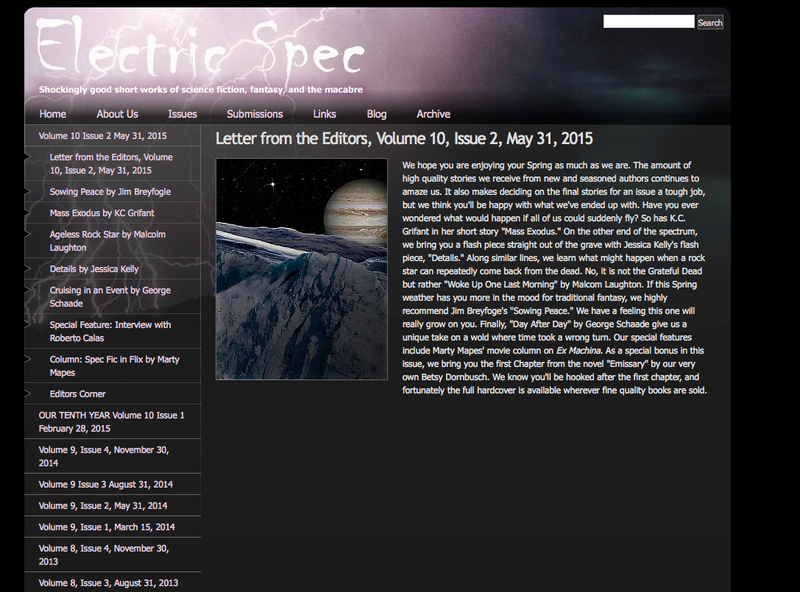 Read more in my newest story, MASS EXODUS, and other science fiction, fantasy and speculative fiction tales are available in the latest issue of Electric Spec. I also wrote a guest author’s post explaining the idea for the story. “What the Storm Brings” and other unsettling tales are available in the latest issue of the excellent Lovecraft eZine (#34). This story was inspired by Superstorm Sandy in 2012 and the eerie anticipation-anxiety that descends on a town before a weather disaster. Let me know what you think in the comments!